Stand 12 - The Parish Church of Sarum Saint Martin, more commonly called Saint Martin's Church. 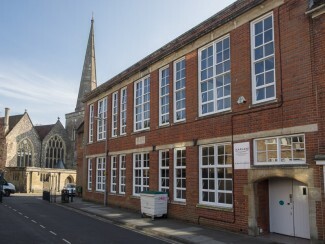 The former St. Martin's School, St Martin's Church St. The oldest part of the present church dates from the early 13th century, but there is evidence to suggest that it stands upon the site of an earlier church which was founded here before 1091, well before the beginning of the new Salisbury Cathedral in 1220. Part of the chancel of St Martin’s Church predates the Cathedral by about 50 years and some decorated masonry has been identified as salvaged from the original Cathedral at Old Sarum. It is a church full of treasures and has recently been redecorated and has a light and airy feel. The stunning new altar, will be unlike any other you have seen. It has gold Cosmarti mosaic and built with the local Purbeck stone. Other interior features include the finely carved rood screen – dedicated to the memory of a young soldier, Cecil Rawlings, who was killed in action in 1915. There are also three fine stained glass windows by Christopher Webb and a beautiful sounding organ built by William Hill in 1869. Externally, the most striking feature is the 14th century spire. The spire is very reminiscent of that in the Cathedral. St Martin’s has always had a close relationship with the Cathedral. Sadly, the Church can no longer be left open to the public as in days gone by. The Church interior can be viewed on Saturdays between 10am-2pm. It may be possible to view on a weekday morning too, please telephone 01722 503123 in advance. 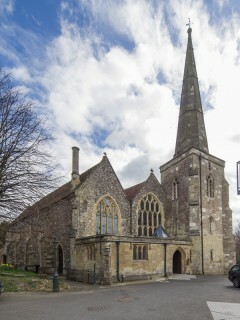 See St Martin’s Church website for more in depth history, details of services and concerts. 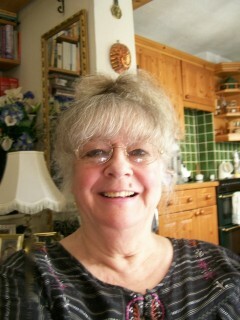 Naomi Parkes, a former pupil of St Martin’s School, has vivid childhood memories of the Church. Listen to the audio clip at the right of the page or to your downloaded MP3 file from the Downloads page. This formidable looking building for a school, has played a significant part in the educational history of Salisbury. The original building was a malt house. It was fitted out as accommodation for French prisoners of war in 1811, so it was clearly adaptable. In 1812 it became Salisbury’s first ‘National School’ – a worthy attempt to provide cheap, or free, education for all children. After a shaky start, by 1859, it was a successful school, with about 200 boys and 90 girls. In his book, ‘I Remember, I Remember‘, Arthur Maidment, a former pupil of St Martin’s School, describes an annual ceremony, held here, in the street outside the school, in the inter-war years. May 24th was Empire Day and schools throughout the land were expected to celebrate Britain’s achievements as the world’s greatest imperial power. The wooden benches and the school piano would be manhandled out into the street and the pupils gathered to perform patriotic songs and recitations. The audience of local dignitaries would sit up on the ready-made grandstand on the opposite side of the street. In Arthur’s day, these included enormously fat Brigadiers – with huge waxed moustaches! Among the school’s distinguished old boys was Salisbury’s V.C., Captain Tom Adlam. Tom was a keen sportsman and had been particularly renowned for his wins in throwing the cricket ball. During the Battle of the Somme, in 1916, he put this skill to military use by pelting enemy machine gun posts with hand grenades, despite being wounded. His award of the Victoria Cross followed. Tom was to make the dedication speech at the unveiling of Salisbury’s War Memorial. A modest hero, he returned to his lifetime vocation as a teacher. Go back along St Martin’s Church Street, round the houses to the right until you join Tollgate Road on your right. Pause at this junction.